Is the 70-200mm zoom lens the most important glass in your camera bag? Many pros feel so. In today's podcast I explain why that's the one piece of photo gear I don't want to live without. Weddings, portraits, wildlife, landscape, events... you name it, I'm usually reaching for the 70-200. Listen in, and I'll give you some details. 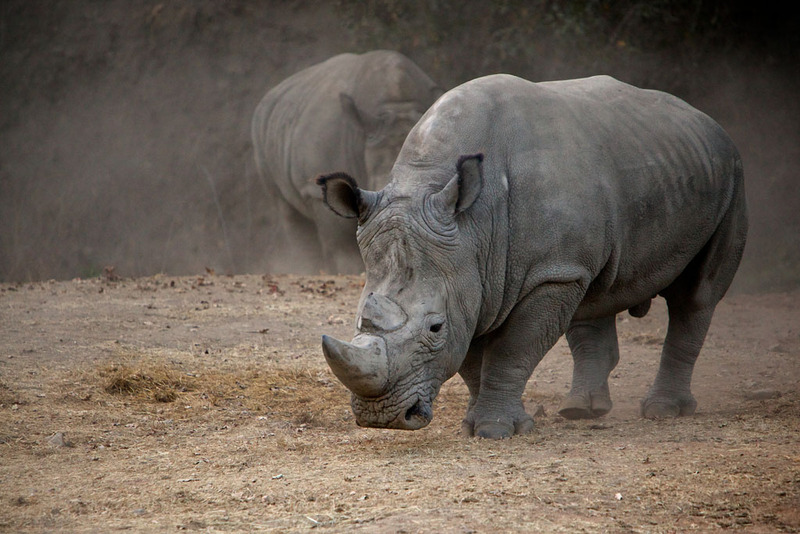 White Rhinoceros photographed with a Canon 70-200mm f/2.8 and a 1.4x Canon extender on a Canon 5D Mark II. Photo by Derrick Story. Click on image for larger version. We're making plans now for the Spring 2011 TDS Photography Workshop. If you want your name on the reserve list, just drop me a line. Heck yes! I love that lens! 70-200 f/2.8L IS! :) And with the 1.4x extender and the 7D it's incredibly versatile. I just got the 7D as a birthday present, so the lens isn't technically mine, but unless I somehow find the Mark II version before college, I'm taking it with me next year. "I was just listening to your podcast about the 70-200mm lens and heard you mention camera shake and the aps sensor sizes. You stated that there would be more camera shake due to the "lens factor" rule but this isn't necessarily true. The smaller sensor is a crop factor, not a focal length zoom factor. The light passing through the lens isn't getting "painted" a greater ratio because of the crop. I like to use a laser pointer as an example when taking camera shake to students. The crop factor isn't changing the distant the light moves across the sensor, therefore sensor size doesn't effect camera shake, all other variables being constant. Hope this clears things up a bit for you and the listeners." Derrick I listened you podcast and couldn't agree more with the use of such a lens. I am a Nikon user but the 80-200 f/2.8 is my second most used lens, after the 12-24 f/4. Anyway, I have a comment about the crop factor and shutter speed. I kind of disagree with the other listener and agree more with the initial idea of multiply the shutter speed by the crop factor. I understand that the smaller sensor is just a crop factor and not a focal length zoom factor or like if you add the TC 1.4. Yet, a smaller sensor also means a smaller viewing angle out of the lens, therefore if the shutter rule of thumb was made for the viewing angle of the 35mm format, which is 1.5x bigger than the digital crop sensor, the shutter speed should be increased by the same factor. In other words, 35mm format: shutter speed = 1/focal length, then on the digital cropped sensor: shutter speed = 1/1.5x focal length (1.6 for Canon). This is anyway what I think. Great podcast anyway! !